MJR! Holcomb Water Crossing Work - MJR! 5 Hardworking Adopt-A-Trail volunteers; Chuck, Alycia, Doug, Cathy, and Ryan, worked an eleven hour work day on the Holcomb Creek trail moving rocks, mud, and even bigger rocks. The AAT day began with our safety meeting and breifing at the valero market/gas station. We traveled through green valley and stopped at the “west” entrance to 3N93 to check on the fence. We were glad to see the fence was still intact from out previous AAT day two weeks prior. Since Ryan had managed to pickup the forest service trailer along with some extra fencing materials, the AAT crew added some additional posts to futher prohibit access through the west end entrance. The AAT crew spent about an hour working on the fence. Traveling to the east entrance of Holcomb Creek, by means of 3N14, the AAT Crew entered the Holcomb Creek Trail and approached the MAJOR project of the day – draining the nasty black pond formed at the creek crossing. After discussing various options a plan was formed to divert water from the pond to allow the pond to drain. A diversionary dam was constructed using four trailer loads of rocks to applish this. 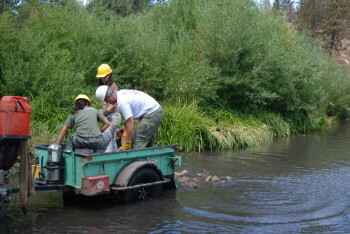 The goal of this task was to follow Greg’s direction to raise the stream crossing with rocks to eliminate stream water contact on vehicle under carraiges. After allowing the pond to slowly drain we found the nasty murky mud hidden below the water. This work project will certainly need many more workers and AAT days to help raise the stream bed. 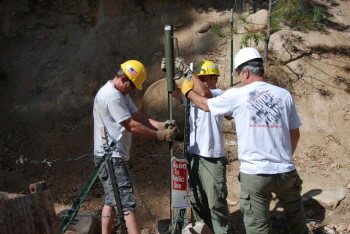 After lunch our AAT crew moved toward the rock garden to continue building and extending it. Together the crew managed to add about 3-4 more feet of rock to the end of the rock garden. And yes, at days end Chuck managed to move the biggest rock of the day which now helps futher enhance his bragging rights! Our work party finished work on the Holcomb Creek trail at about 6pm with no injuries or broken equipment. -The rock garden still needs about 10-20feet more of rock but this project now falls second in priority to raising the stream bed.